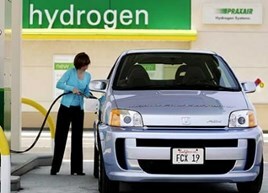 New survey results have shown that 42% of motorists would buy a hydrogen car over electric. Servicing Stop surveyed 1,100 motorists on their preferences to electric and hybrid technology, with 58% preferring “familiar” electrics. The results showed that more than two thirds would like to see more hydrogen filling stations, suggesting a potential increase in popularity for hydrogen, with 42% of motorists stating that they liked the fact that you can get 300 miles from a tank. The survey revealed that the hydrogen price tag deters motorists, with just under half saying the £66,000 cost for a Toyota Mirai put them off. Only 38% were concerned by the fuel explosive nature. Servicing Stop’s founder and chief executive Oly Richmond (pictured) said: “Nobody quite knows what our cars are going to run on in thirty years time, but it’s clear they could quite well be hydrogen.